That is all I will say about the above. I will leave it to the reader to confirm or refute the generalizations in their own mind. You can go cheap in any of the three categories, though it is easier to go cheap with the smaller formats. If you are new to film, I would suggest that you start with 35mm and work your way up to the big stuff as you learn more about the film medium. Got that? Given a little thought and research and other people's junk becomes your treasure! M, P, and A series Pentax bodies. The P3n/P30n are particularly underpriced despite having robust build and features (http://kmp.bdimitrov.de/bodies/film_P/index.html). The K1000 is a great camera, but is generally overpriced due to its reputation as the ultimate student camera. The KM is better at a much lower price. Chinon, Ricoh, Cosina/Vivitar. Yes, Yes, Yes! Minolta. Great values to be found here. Think XG-M or similar. Any of the above bodies can be bought, often with normal lens attached, for less than $50 in very good to excellent condition. Nikon, Canon, Olympus, and Konica are also good, but come at a premium price. If you have a question about a particular model, see if you can find the manual online (http://www.butkus.org/chinon/ is a great resource. Leave him a donation if his manuals are useful to you.) The camera manufacturers Web sites often have manuals for legacy product as well. The camera's features and specifications are usually listed in the manual. Lenses are a much trickier proposition. Until this last year (2010), you were pretty safe with almost any lens mount. Most had been orphaned. With the advent of micro 4/3rds digital cameras, the market is heating up for many of these previously orphaned lens mounts. Still though, good deals can be found in the Vivitar and store-brand lines. Many of these cameras were sold with "walk-around" 35mm-80mm zooms of reasonable quality. These are often under-valued in the current market due to limited application on most digital bodies. Also consider that 28mm, 50mm, and 135mm prime lenses are usually very good even when sold as a store brand and are often reasonably priced. Fixed lens 35mm rangefinder cameras are wonderful tools and are often great values as well. Rangefinder cameras are the ultimate for street or club photography. Many have excellent fast optics mated to lightweight compact bodies. Again, the best value is in models made from about 1970 on. Some of the rangefinders from the 1960s are nice, but many will need a fairly complete overhaul before being useful. Think Yashica, Minolta, Canon, Olympus, and Ricoh. Think auto exposure with manual override. Avoid auto-focus. Don't even think about interchangeable lens rangefinder cameras. You can't afford to play in that space. While most of the high-value product of interest to us bottom feeders is in the 35mm space, there are some great values to be had in cameras that take 120/220 roll film. Unfortunate, you have to be a bit of an expert to determine a good deal. If you are set on the larger negative, think Yashica Mat 124 twin-lens reflex as a good starting point. This is going to sound cruel, but if you are tempted by FSU (Former Soviet Union) models such as Zenit, Zorki or Kiev, don't be. Ditto for all but the most recent Chinese stuff. The value is not there. For similar money you can get a Ricoh or a Minolta. I know that from which I speak. I have a Zorki 4K, a Kiev 4A, and a FED-2. I love all three of them, but I am a fanatic and none of the three are as useful as a general photographic tool as my Ricoh XR-2s which was less money that any of them. Ditto for any of the various "toy" cameras such as Lomo and Holga. 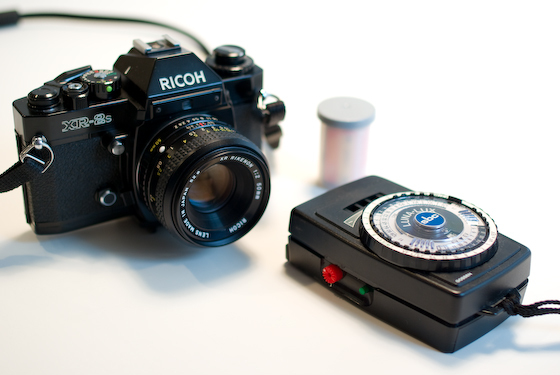 Sure, how about this Ricoh XR-2s from the late 1970s. It features aperture-preferred auto exposure with metered manual, electronically controlled vertical metal shutter (yes, it will work at 1/125s without batteries), exposure compensation, DOF preview, and a full information viewfinder in a robust standard K-mount body. I paid $35 with attached lens for this dependable workhorse. I think I paid $35 for this body with case in like new condition. 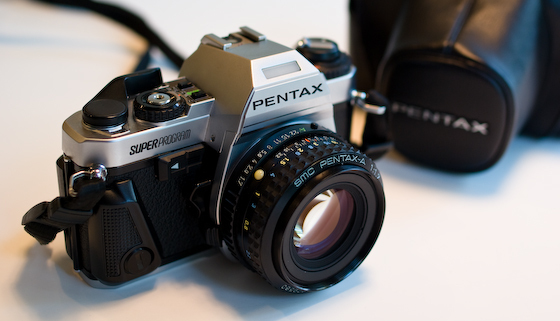 The Super Program was almost top-of-line for Pentax in the early 1980s. The only thing better would have been the LX. Next time, I will reveal the secrets of cheap film! eBay: The obvious one. Be careful and patient. Only bid on items where the seller confirms fully operational status. Never bid more than you really want to pay. Be wary of any seller that counters negative feedback with a pointed attack on the buyer. Be aware of inflated shipping costs. Most cameras can be shipped, insured, anywhere in the U.S. for less than $15.00. That is all. You may leave now! I would suggest inclusion of Konica along with Minolta in your list of dead mount bargains. Can't wait for the secrets of cheap film! One category you left out is the half-frame 35mm. Olympus Pen EEs can be had pretty reasonably and you get twice as many shots (albeit smaller negative size) per roll of film.